Photo Credit: Julie Bigboy / Day Trips TravelingMom, Jenn Nichols, and Kelly Denton. 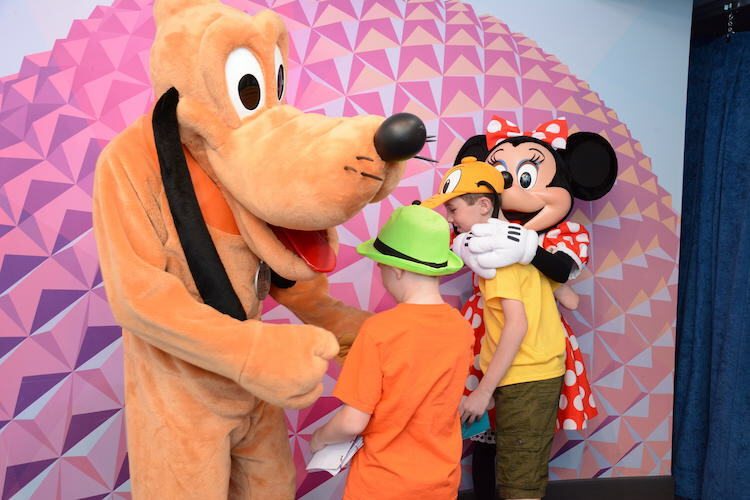 What does fabric, duct tape and glitter have to do with your next Disney Parks vacation? 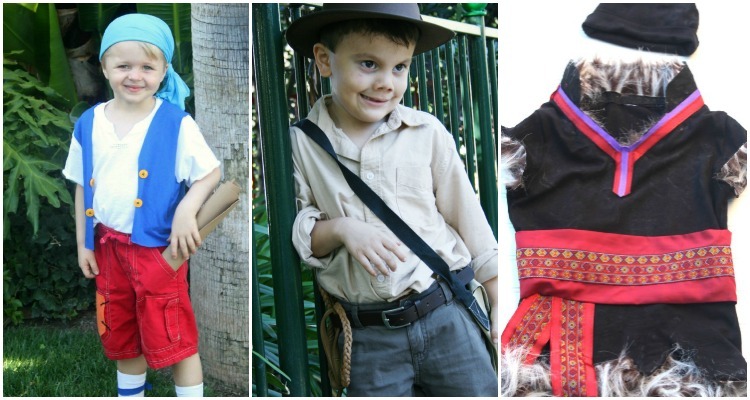 Spend a little time before your trip creating an easy DIY Disney costume for your kids. 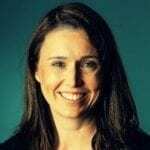 You can save money and still be their fairy godmother. Letting your preschooler wear a costume on your next Disney parks visit is an easy way to add pixie dust to your trip. 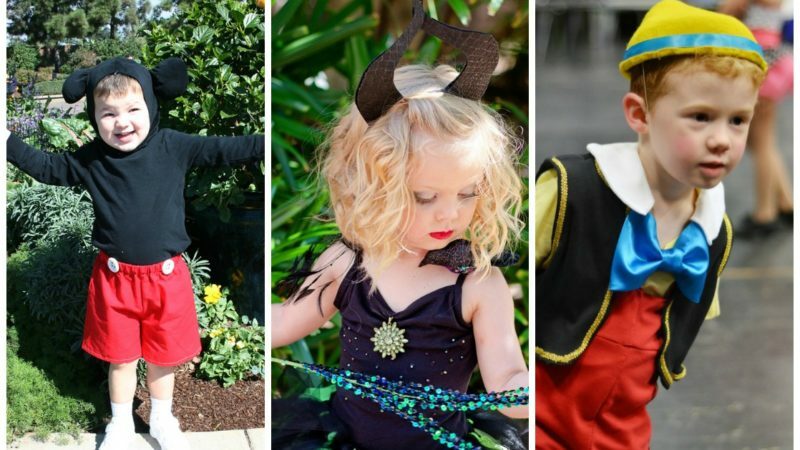 There is no shortage of Disney costumes to purchase in the parks, at least for little girls but for little boys or families wanting to add pixie dust without breaking the bank, an easy Disney DIY costume is a better option. All you need is faith, trust and pixie dust (and a few ideas for inspiration). Keep in mind not all DIY Disney costumes are created equal. I prefer easy Disney costumes with limited or no sewing involved. That means I often utilize duct tape, fabric fusion or iron-on vinyl. I also prefer to start with clothing pieces we already own or can find at a thrift store or discount retailer. DIY costumes can be modified to accommodate specific weather conditions. It’s unlikely the same costume can be comfortably worn in both the winter and summer without some adjustments. Keep weather and comfort in mind when planning your DIY Disney costume. Need a little inspiration? 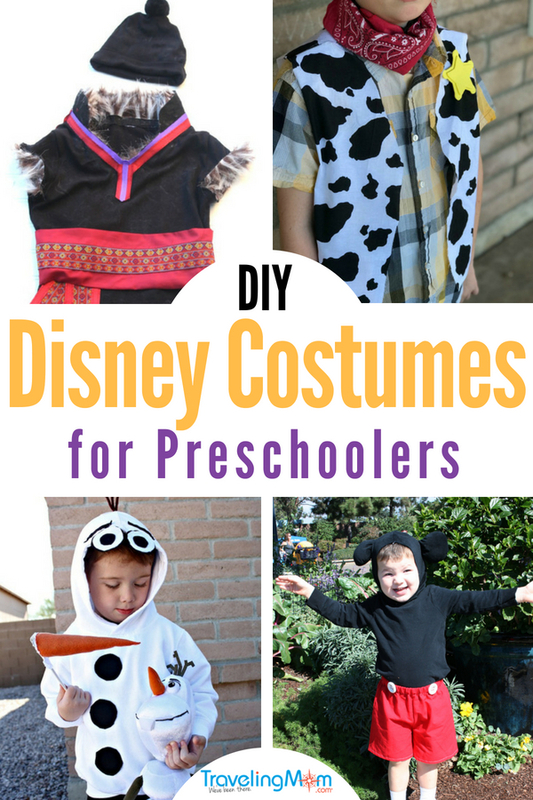 I’ve rounded up some adorable Disney DIY costume ideas that will inspire you to create costumes for your preschooler. We know princesses are all the rage with little ones. The best preschool princess costume tip is to bring your costume from home and then let your little one pick out a fun accessory in the park. Or splurge on a visit to the Bibbidi Bobbidi Boutique. Moms don’t miss the chance to experience the new Bibbidi Bobbidi Boutique for adults; it’s called Character Couture! Girls shouldn’t have all the royal costume fun. 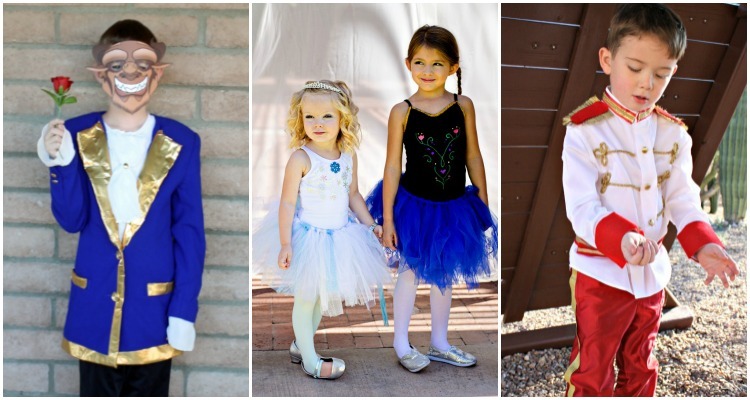 Check out these royal Disney DIY costume ideas that include some prince costumes for the boys. These three classic Disney prince costumes are easy to make and look adorable too: Prince Charming, Snow White Prince, and Beast Costume. Photo Credit: Mickey Mouse costume from Julie Bigboy / Day Trips TravelingMom, Maleficent costume from Jenn Nichols, and Pinocchio costume from Kelly Denton. Don’t have a princess fan at home? You can’t go wrong with a classic Disney costume, like Mickey Mouse or Winnie the Pooh. Personally, we’ve always been big fans of Peter Pan and his crew. In fact, it was our family costume theme the first year we went to Mickey’s Halloween Party. Don’t forget about Bambi and Pinocchio too, there are plenty of classic non-princess characters to choose from. With Toy Story Land opening at Walt Disney World and Pixar Pier at Disneyland, don’t be surprised if you see a lot more ‘toys’ in the parks. 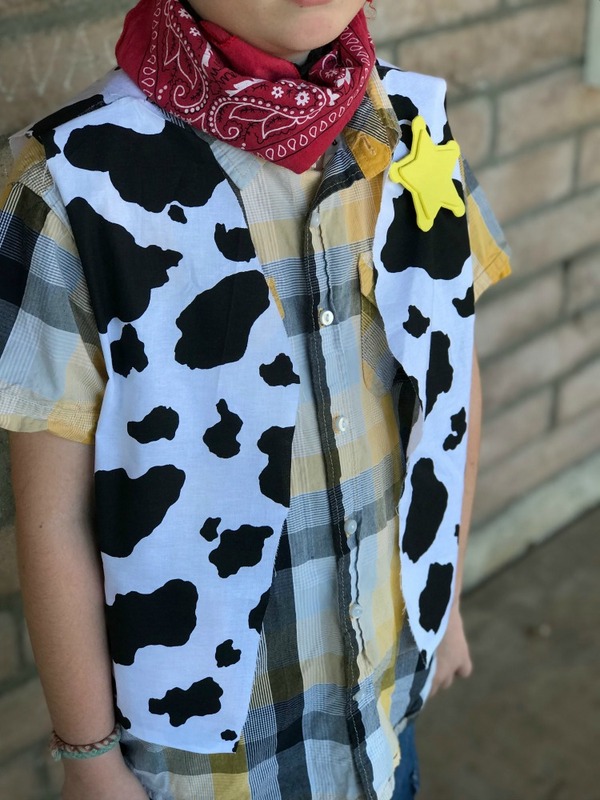 This DIY Woody costume is pretty easy to pull together. How cute is this DIY Toy Story Alien costume? 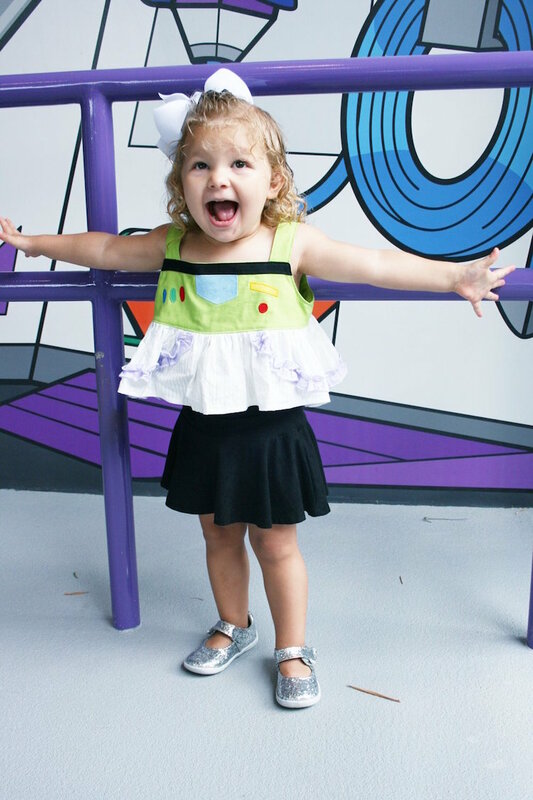 I love this Buzz Lightyear inspired outfit that our Day Trips Traveling Mom created for her daughter! You don’t have to stick to classic Disney characters either. Recent Disney films like Finding Dory and Inside Out have inspired lots of easy Disney costumes too. And don’t forget about some of the new Disney Junior shows like Jake and the Neverland Pirates, Miles from Tomorrowland and Doc McStuffins. Check out these adorable and easy newer Disney character costumes that your little one would love to wear. We loved Inside Out so much it was our family theme for Mickey’s Halloween Party one year. I’ve seen some amazing Disney costumes inspired by attractions in the parks. Like bellmen from the Tower of Terror, ghosts from the Haunted Mansion, and pirates from the Pirates of the Caribbean. Those ideas might only work for more adventurous preschoolers though. If you have several little kids, then Small World costumes would be adorable. A friend’s son even dressed up as a Disney VIP tour guide one year, complete with plaid vest. Here are a few more Disney Park inspired costume ideas. A simpler way for a little dress up fun is Disneybounding. What is Disneybounding? Simply dressing up like your favorite character using regular clothes. No costume required. Check out our fun Toy Story Land Disneybounding ideas. it’s a fun way to stay comfortable while ‘dressing up’ in the parks! The great thing about Disneybounding is that the whole family can participate together. Remember traditional costumes are only permitted for kids 13 and under except during special events like Mickey’s Not So Scary Halloween Party when everyone can wear a costume. Want more Disneybounding ideas? 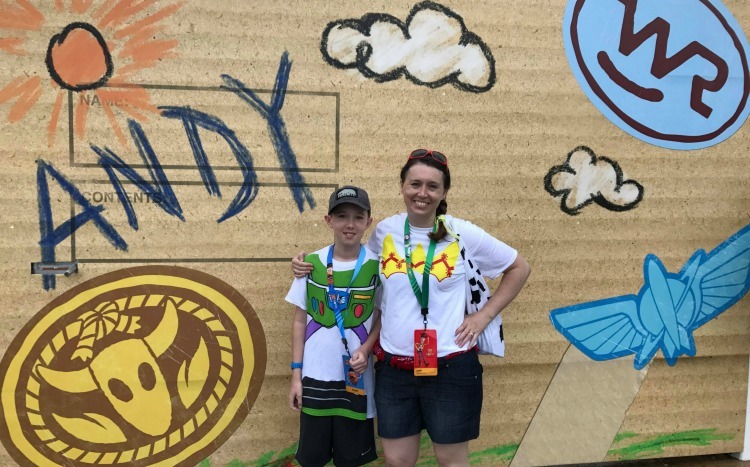 Check out Disneybounding ideas for kids, my boys had so much fun wearing simple outfits inspired by their favorite characters. Do you have easy Disney Costumes for your Disney Vacation? Share with us in the comments below.